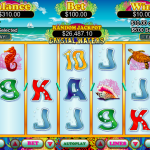 Crystal Waters Slot is a 5 reel, 20 pay line video slot that is set in a tropical paradise. You can swim with the dolphins in order to double your prize. Enjoy the crystal waters while you rake your prizes! This game was developed by RealTime Gaming and is compatible on all platforms. This video slot can be played for real money and without needing a download. Dolphin is the wild symbol and works as the substitute icon. It can replace all the symbols except the Yacht. The coin range starts from $0.01 which makes it the perfect game for the newbies and those who are playing with limited resources. Some of the symbols you might come across are the dolphins, turtles, exotic fish, yachts, and watery versions of A, K, Q, J, 10, and 9. The dolphin is not the only wild symbol. There is another one which only shows up in the free spin mode. It is an exotic fish and acts as a substitute multiplier. It means that you can multiply your winnings up to a maximum of 16 times when you get this wild in the free spins. There is no bonus game though the substitute multipliers offer good prizes. There is an RTG powered progressive jackpot which you can win at the end of a spin. If 3 or more yachts appear, you will get 15 free games along with a special payout. In the free game, if a bonus fish shows up on the third reel, it can replace any other symbol except for the Yacht. The dolphins can appear only on the second or the fourth reel. 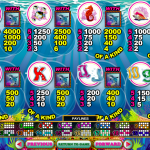 When you hit a winning combination with the help of bonus fish, the win is multiplied by 2, 4 or 8. 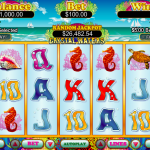 The game supports realistic graphics for an ocean-themed slot. Though the game can be played with pennies, there are also high-limit betting options. For another great and engaging game you should consider playing Craps by RealTime Gaming.